The bells of St. Christopher’s, Willingale, Essex were restored and augmented to a ring of six in 2012, see Ringing World No. 5310, 30 November 2012. Prior to the restoration the bells had been unringable, therefore, there was not an experienced band in the village. The community work to restore the bells had stirred much interest locally such that following the restoration there were many novices enthusiastically getting to grips with ringing rounds. As this group started to develop basic bell control and struggled with the concept of rope sight it became apparent that all was not well with the fourth. Visiting experienced ringers had uttered words like “oddstruck”. Gradually it was realised that to achieve good striking the fourth had to be rung, when looking at the ropes, on top of the bell in front and the bell following had to leave a large gap. To experienced ringers this might not have been a problem as their ears told them how to ring the fourth but for a band consisting mainly of novices it can frustrating. As progress was made to plain bob doubles the oddstruckness of the fourth became more of a cause of problems. During the restoration the fourth was not tuned, it is a tall bell and sounds “dead”. Attempts were made to correct the oddstruckness but this was very hit and miss and yielded little improvement. The restoration had adopted traditional materials and techniques, e.g. timber headstocks that do not have twiddle pins that enable the position of the clapper bearing to be moved and fixed relative to the bell and thereby correct oddstruckness. By early 2014 it was decided to replace the fourth. Also, the three practice evenings per week had caused some rumblings amongst villagers, not unreasonably so because the ringing was often not melodious. So that ringing could be “silent” a simulator was installed using David Bagley’s hardware. A chance meeting with David Bagley and Matthew Higby at the 2014 Newbury Ringing Roadshow made us aware of the Bagley oddstruckness meter and Matthew’s use of the meter to correct oddstruckness. The meter uses an optical sensor to detect the bottom dead centre of the swing of the bell, and a microphone to detect the moment at which the clapper strikes. It also measures the swing time of a bell. The measurements can be plotted on a graph and show any bells that are oddstruck or have an incorrect swing time. 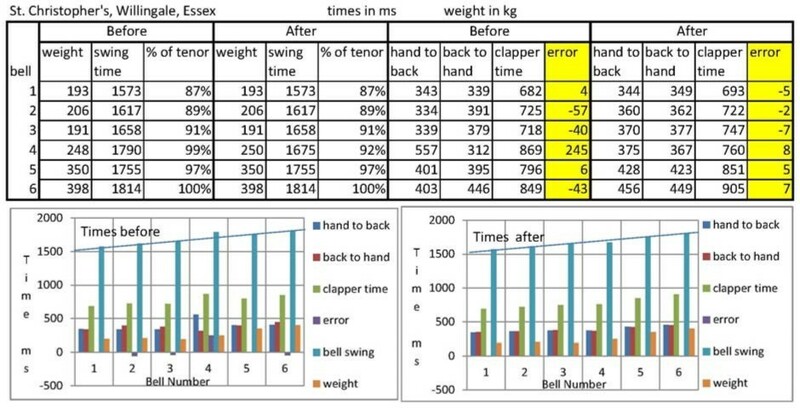 Ideally the hand stroke and tail stroke times will be identical within a tolerance of 20ms and, along with the swing times, will follow a rising curve treble to tenor like the weights of the bells when plotted on a graph. The Willingale bells are now a delight to ring, sound much better and our “up and coming” ringers are now able to make better progress to ringing methods. There are many towers where oddstruckness has been eliminated using the meter and the resulting improvement in striking has been very noticeable for ringers of all abilities. Bell casting and hanging might have been around for hundreds of years but these cases show how the application of modern technology can improve greatly the traditional craftsmanship.